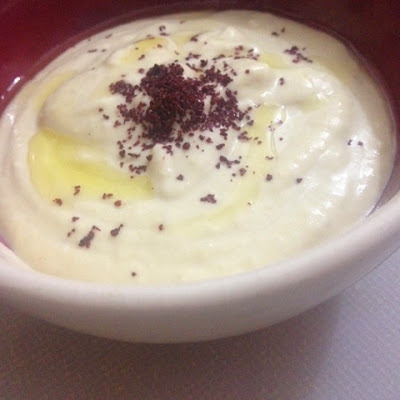 One of the first posts I wrote on this blog was on how to make hummus. Six years on, nothing much has changed. Hummus paired with pita bread or with crispy lavash remains my favourite snack. Add a salad or a couple of falafels and we're talking about a regular dinnertime occurence. One thing has changed though. Tahini, the sesame seed paste essential to hummus recipes, was impossible to find in India then so I wrote of a makeshift recipe. Middle Eastern foods have since become much easier to source so it's high time we talked about a proper hummus recipe. At least 12 hours before you make hummus (usually the night before), soak 1/3 cup chickpeas in 2 cups of water. The next morning, boil chickpeas in a pressure cooker until they are very soft. You should have around a cup of cooked chickpeas. Put them in a blender alongwith 3 cloves of peeled and minced garlic, 2 tbsp tahini paste, 1 tsp lime juice (half a lime should do), 2 tbsp olive oil and a hearty pinch of salt. Blend into a smooth paste. Taste and add more olive oil or lemon or salt until you get a perfect tasting hummus. Scrape into a bowl, pour some more olive oil on top and if you like, sprinkle with sumac.